This past weekend I attended a colloquium called “Markets, the Environment, and the Developing World” in Key Largo, Florida, which was funded by the Liberty Fund and hosted by PERC. The event lasted two and a half days brought together about a dozen professionals from across the world and environmental community to talk about such things as the design of management institutions, contracts, and the challenges specific to Africa, China, and Latin America. 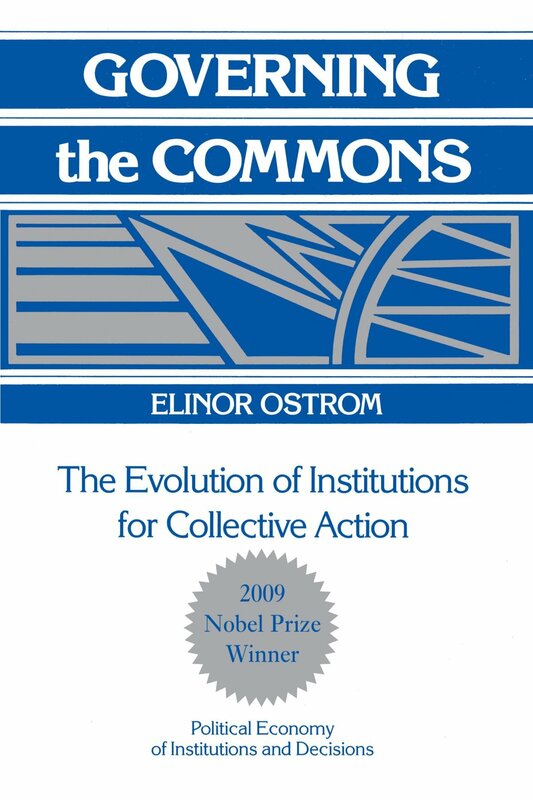 It was during the first session on institutions that I revisited Eleanor Ostrom’s eight principles of design for common pool resource institutions. Though her thinking very much underpins my work today, it had been a while since I took a look at the exact principles. As we discussed them, I found myself pondering to what extent I’ve found the design principles to be accurate and sufficient in my past five years of professional work in fisheries conservation. And I also wondered if there is today at least conceptual clarity about how to “fix” a CPR institution if one or more of these design principles is violated. I ultimately decided that the principles could do with a better emphasis on ensuring economic benefits for resource users and recognizing the importance of social penalties, like shame, embarrassment, and lost respect, in affecting compliance. And nicely, I see that these modifications were indeed made in between the original publishing of Governing the Commons in 1990 (which is the text used at the colloquim) and her final updating of the principles in a book chapter published almost 20 years later in 2009 (see Property Rights and Land Policies, edited by Ingram and Hong). You can specifically see these updates in principles #2 and #5. Clearly Defined Boundaries. 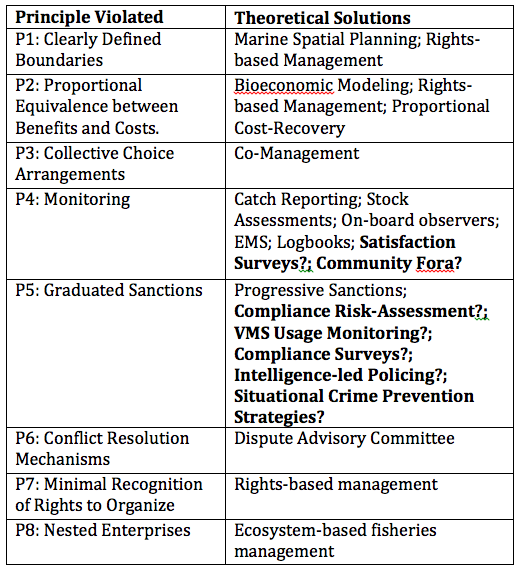 The boundaries of the resource system (e.g., fishery) and the individuals or households with rights to harvest resource units are clearly defined. Proportional Equivalence between Benefits and Costs. Rules specifying the amount of resource products that a user is allocated are related to local conditions and to rules requiring labor, materials, and/or money inputs. Collective Choice Arrangements. Most individuals affected by harvesting and protection rules are included in the group that can modify these rules. Monitoring. Monitors, who actively audit biophysical conditions and user behavior, are at least partially accountable to the users and/or are the users themselves. Graduated Sanctions. Users who violate rules in use are likely to receive graduated sanctions (depending on the seriousness and context of the offense) from other users, from officials accountable to these users, or from both. Conflict Resolution Mechanisms. Users and their officials have rapid access to low-cost local arenas to resolve conflict among users or between users and officials. Minimal Recognition of Rights to Organize. The rights of users to devise their own institutions are not challenged by external governmental authorities, and users have long-term tenure rights to the resource. Knowledge sharing. Users and their officials regularly participate in knowledge sharing activities to reduce divergence of perceptions of local conditions. I also think that some additional work needs to be done so that we know how to “fix” institutional designs when these principles are violated (that is, of course, assuming that the absence of the principle is leading to management problems). When I read each principle, I have a clear idea of how an NGO or government might proceed in the event of a violation, but not for principles 4 or 5 (and indeed, you could say because of this I’m now working on my PhD). The collective problem that I see, based on my experiences with a number of marine conservation NGOs and fisheries management agencies in the developed and developing world, is that there is a generally lack of agreement on how we can make it so a) fisheries compliance officers (i.e., monitors of user behavior) are at least partially accountable to fishermen and b) users who violate the rules are likely to be sanctioned. Thankfully, there is at least a lot of attention these days to the latter violation, and this allowed me to put down a laundry list of possible theoretical solutions in the event that principle 5 is violated. What we need now is, of course, empirical evidence that these solutions work not just in theory, but practice. I also put down a few ideas on what might be done in the even that principle 4 is violated in relation to the accountability of behavioral monitors, but on this I am just tossing out a couple ideas. I’m going to make it a point as I go forward to talk to my colleagues about these issues and see to what extent they might agree/disagree.